Our member's are singing Santa's praise! We have given out over $10,000 worth of bonuses and we aren't stopping there. Over the next 11 days expect constant rewards and exciting bonuses. 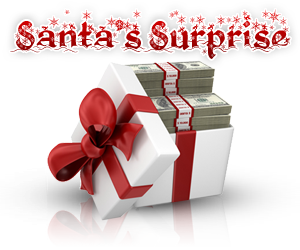 If you haven't been logging in to see what Santa has in store for you then you are missing out. Over the next couple weeks Fly Casino will be releasing even more games for our members. There is a game for everyone but all will enjoy our additions. We pride ourselves with offering innovative and exciting games for our members and a truly elevated gaming experience. Login everyday during December 22nd, 2013 and December 27th to see what Santa has in store for you! Each day is something different but we can't tell you what it's going to be…it's a surprise.